Symbiosis has delivered Premier Marina’s presence at Southampton Boat Show since 2012. The UK’s largest on-water boat show is held annually over 10 days in September in Mayflower Park, Southampton. To design, build and manage the 13.5m x 8m stand space within an individual outdoor quayside marquee at the Southampton Boat Show 2015. 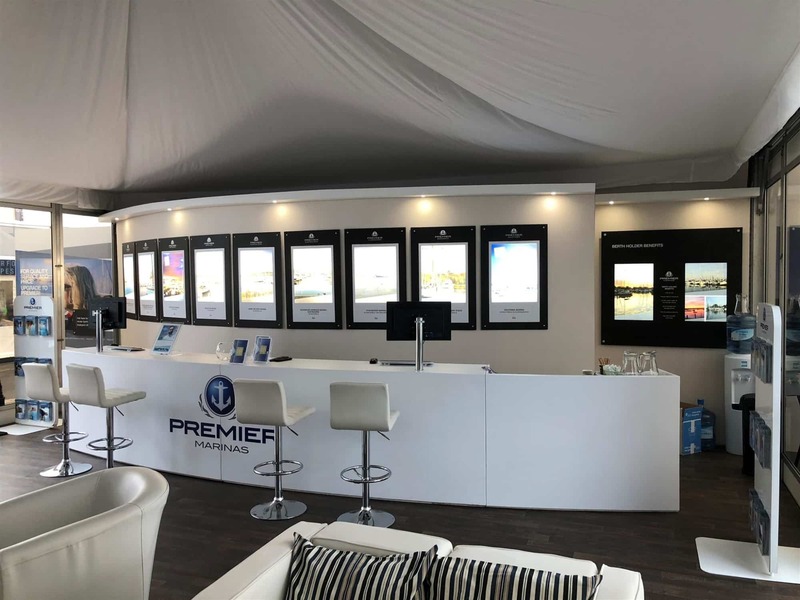 To present a high specification, luxury interior with upmarket quality fixtures and furnishings in keeping with Premier’s VIP customer lifestyles. It must be open and welcoming to maximise visitor footfall and ensure their hospitality and comfort throughout. A striking branded entrance was created with rooftop flags, logo etched toughened glass stair panels and weatherproof carpeting. This led into a spacious interior with dark wood laminate flooring cut with winter white high pile carpeting. Large purpose built welcome counter concealed professional refreshment equipment, computers and printers. While the curved wall with its stunning back-lit marina images hid a handy store room. A bespoke coastal map was created from dark wood with LED lighting highlighted marina locations. 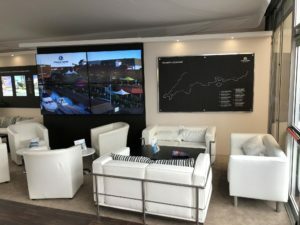 While a four screen slim bezel video wall was pre-loaded with presentations and corporate videos. 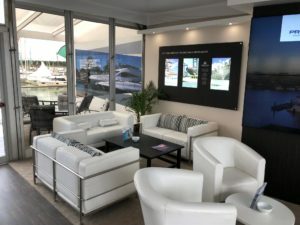 Contemporary white sofas and chairs finished the look and offered plenty of comfortable meeting areas. Substantial secure storage included heavy duty shelving for bar supplies and marketing materials, lockers for personal items plus cloakroom facilities. 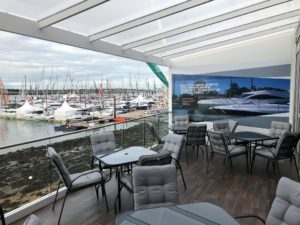 And what ever the weather the stylish decked veranda with its acrylic roof ensured that guests made the most of the fantastic views across the harbour. 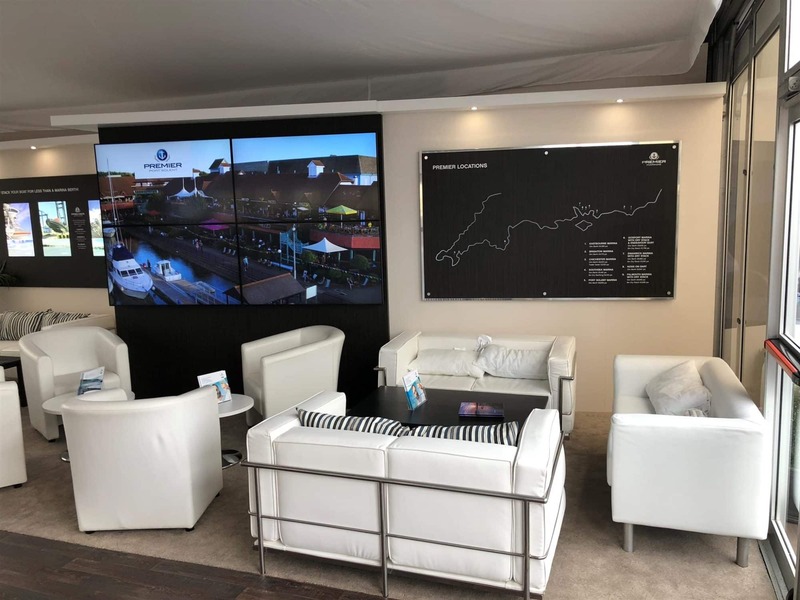 Symbiosis is now working on the design of the Premier Marinas stand at the Southampton Boat Show 2019. 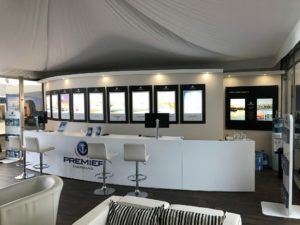 Did you find the ideas in the ‘Premier Marinas at the Southampton Boat Show 2018‘ case study interesting?